I like how we arrive in Munich Sunday night and take off on a day trip out of town the very next morning. A. really wanted to check out some castles while we were in Germany so we took a two-hour train ride into Bavaria to see the fairy tale-like Neuschwanstein Castle. It was quite the sight to see it perched on top of the rugged hill (and then it was quite another sensation to feel that 30-minute uphill climb to tour it. I swear A. only brought me on this trip to get my stubborn behind to exercise). 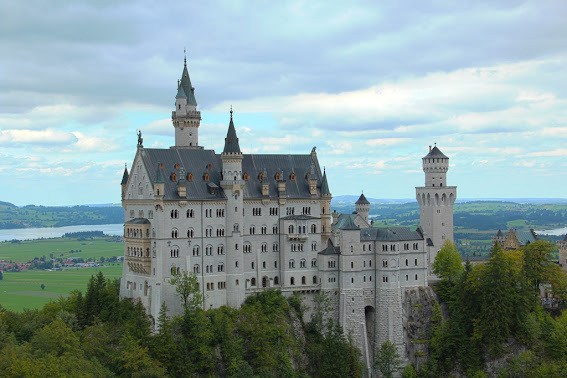 King Ludwig II wanted his home to be a shrine for composer Richard Wagner and details like wall paintings depicting scenes from Wagner's operas and even the name of the castle itself (which is in Wagner's Lohengrin opera) showed just how in awe Ludwig was of Wagner. Though the romantic castle was opulent for just one inhabitant, if you think about it, the king's intentions were actually a bit humble. Rather than take this opportunity to showcase his grandeur and plaster his image and name in every corner of the castle, his name and likeness seldom appears through the palace and the man dedicated his entire home to the beloved composer. It's so breathtaking from a distance (I actually preferred seeing it from the scary bridge across the way than from the inside especially since photos weren't allowed during the tour) that it served as the inspiration for Disneyland's Sleeping Beauty Castle. It's really quite a shame that the reclusive king drowned before the palace was completed (construction immediately halted upon his death) and it was opened to the public only seven weeks after he died. Hohenschwangau, Ludwig's father's palace and one I cannot pronounce without sounding Asian, lies nearby.